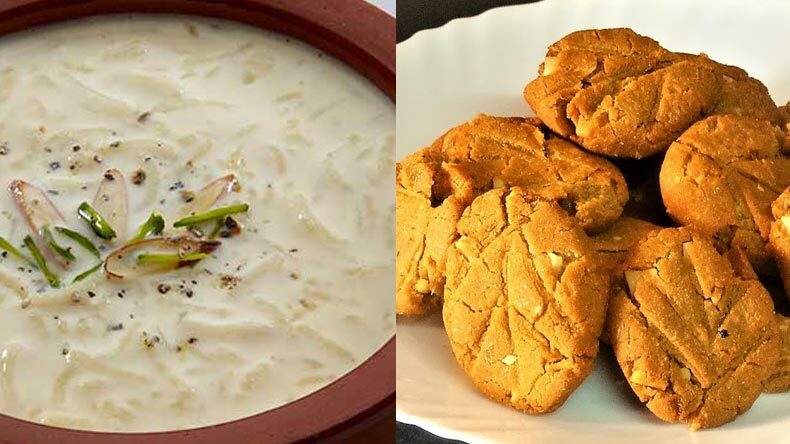 People during the 4-day long Chhath Puja celebrations prepare delicious, mouth watering dishes which are also used as part of the festival rituals. Chhath Puja is one of the most awaited festivals in the state of Bihar, Jharkhand, in parts of Uttar Pradesh, Chhattisgarh and Bengal. It’s a festival to worship Sun God by offering him Arghya (Sun Bathing). Chhath Puja is a 4-day long festival with each day having its own significance and importance. 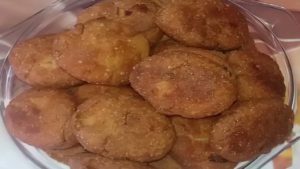 People during the 4-day long Chhath Puja celebrations prepare delicious, mouth watering dishes which are also used as part of the festival rituals. Chhath Puja for this year will be celebrated from October 24 to October 27. During Chhath Puja, devotees offer their prayers to the sun god, as the festival is dedicated to the Sun and his wife Usha. It’s a time when devotees through their prayers dedicated to the Sun God thank him and express their wishes for a prosperous, healthy, wealthy and fortunate life. During its 4-day celebration, day one is dedicated to holy bathing. On day two, people observe fasting and abstain from drinking water called (Barta). People stand in water for long periods of time, and offer prasad (prayer offerings) to the setting and rising sun. One of the most famous dish prepared during Chhath Puja is thekua. One would need whole wheat flour, jaggery (gur), sugar, chopped coconut, ghee, green cardamom, water. Take a container and ingredients such as sugar, gur, water, cardamom. Add ghee, wheat flour, chopped coconuts and prepare the dough. Take a vessel, add melted ghee in it and deep fry dough pieces till their colour is turned to golden or slightly red. Once they attain the colour, check them whether they are fully cooked and serve them after squeezing ghee from it. 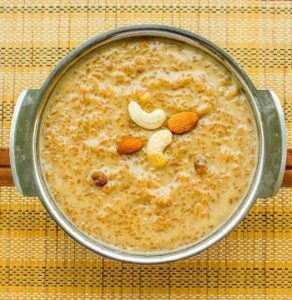 To prepare this special rice kheer, one will require basmati rice depending on the quantity, milk, cardamon, sugar, saffron powder, dry fruits, dried grapes. 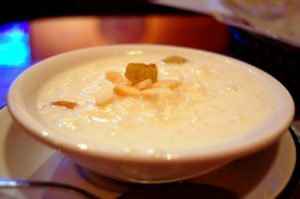 To make this delicious rice kheer, one should first clean the rice and soak them in water. After the rice are washed and soaked they are transferred in the container full with boiling milk. The mixture is then boiled at low flame till it becomes thick. Continuously stir the boiling rice to prevent them from sticking at the bottom. Meanwhile add sugar to taste. One can also add saffron to the boiling mixture. Once the mixture appears thick, cut off the flame supply and allow it to cool. Once it becomes cool, garnish the rice kheer with dry fruits and serve cold. 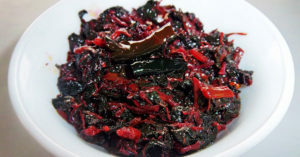 To prepare Lal Saag, one will require — red chillies, turmeric powder, ginger, chopped finely, salt, cooking oil. First, wash the lal saag leaves, cut the hard stalks and chop the leaves. Take a pan, add a little oil in it and heat it with ginger and red chilli. On a medium flame, saute the mixture for a couple of minutes. Ones the saute procedure is done, add lal saag chopped leaves and again saute it for couple of minutes. Add turmeric powder and cook the mixture for 10-12 minutes. One should keep looking at it, and if it becomes dry and sticky, add a little water into the mixture. Put some salt as per the taste and once again saute for 1 minute. Once the saute is done, check the dish if it require some more saute and if not, then serve it hot. 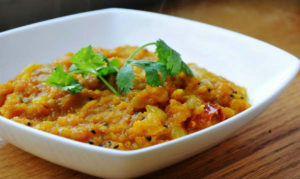 Arrange Pumpkin, ginger, coriander powder, turmeric powder, garam masala, asafetida fenugreek seeds, sugar, raw mango powder (amchoor). Take a pan and add oil, fenugreek, asafoetida seeds and cumin seeds. Saute the mixture for a while. Add ginger, chopped pumpkin, other masalas, salt, turmeric, chilli powder and cook the mixture for a little while at low flame. Keep checking in between and stir the mixture 4-5 times during the cooking process. One can add coriander leaves to garnish it. It’s a sweet dish which is prepared with a combination of milk, water, rice and jaggery, almonds, cashew nuts, raisins, cardamom. The dish is also a part of Chhath Puja ritual where it is offered to Sun God during the second day of Chhath Puja. Take a vessel, pour milk into it and put the vessel on the flame. Take washed and soaked rice, according to the quantity and put into the boiling milk. Stir the vessel continuously and cover it with a lid. Take water and jaggery in another vessel and place it on flame for heating. Notice when the jaggery starts dissolving in water, once it starts dissolving, turn off the flame and put this jaggery mixture in another vessel where you have boiling milk with rice. Once this process is done, add other ingredients like sugar to taste and cashew nuts, almonds to garnish it. At last, finally check the taste and serve it cold.